When I was in college, I took an Art History class as part of my “gen.-ed.”, or core curriculum. We covered this painting in that class and I did what I had done with every other old painting we talked about; I memorized its title – “The Calling of Saint Matthew”, I memorized who painted it – Michelangelo Merisi da Caravaggio, I learned about Baroque style, and about Caravaggio’s turbulent life. We discussed the use of light and dark throughout the painting, and our professor told us who each person was and why they were shown in clothing that would not be worn until about 1,600 years after the event depicted in the painting. All of this was presented to me and I took it as just another old painting. I regret not recognizing the beauty of the painting and my apathy toward the depiction of such a profound and pivotal moment. This painting is not simply a snapshot of a great moment in time; it represents what each of us, as Christians, experience in our lives. Christ calls us to follow Him just as He called Matthew. God uses humans, who are sinners, to be his instruments. 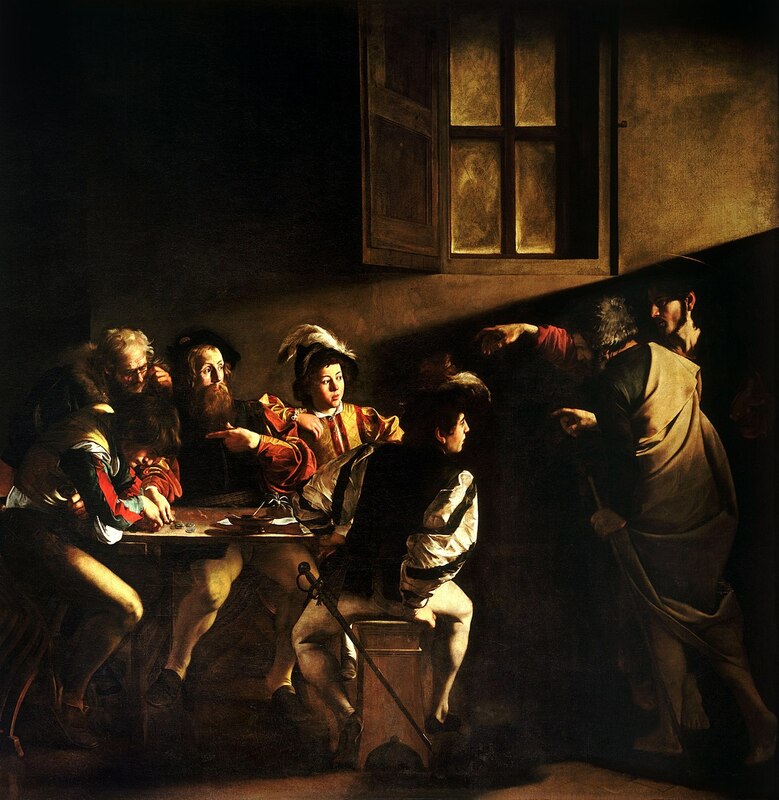 The fact that Caravaggio painted “The Calling of Saint Matthew” is an incredible testimony to this idea. He was a man who had a reputation for being an outlaw, so to speak – he was forced to flee Rome because he murdered a man over a tennis match and a gambling debt (although some have a different theory of the motivation) – but he painted some of the most powerful and iconic works of Christian art. In much the same way that God inspired the troubled artist, Caravaggio, to paint such a beautiful painting, He inspired the sinful tax collector, Matthew, to write the gospel of Jesus Christ. God works through weak instruments and like the rays of light shining in on Matthew, so too does God shine through the weakness of human nature as He uses flawed individuals to communicate His own goodness to the world. Now to look at the painting itself; it may help to have easy access to an image of the painting as you read this. Let’s take a look at Matthew first; immediately, we can see that he has a look of surprise on his face and he gestures to himself as if to ask, “Me?” This speaks to the tendency we have as humans to be skeptical or even to deny ourselves the love of God. Often, we feel that we are not worthy of God’s mercy because of our sinful nature and rather than asking for forgiveness, we turn away from God, the one who wants to for give us and welcome us back into His arms. We can also see that he is leaning back toward his friends and metaphorically, to his life before this moment – a life of greed centered around money. Upon closer investigation however, we can see his legs seemingly drawn toward Christ as though they would get up and walk on their own. This is a statement about the yearning that each one of us has inside us – a restlessness until we leave ourselves and our worldly attachments to follow Christ’s call. It’s also worth noting that the people to the left of Matthew are completely oblivious to Christ as he is calling their friend. They are so engrossed in the coins on the table that they cannot see anything else. In much the same way, as we give in to sin and let it become the center of our focus, we are not only separated from God, but we fail to even notice Him when He is standing right in front of us. Therefore, we feel the most distant from God and His saving love when we fall into sin and spend all our effort adoring worldly idols. This is the reason that the sacrament of reconciliation is so important to us as Catholics; when we commit mortal sin, we are separating ourselves from God and from the Church. Frequent confession of our sins frees us from the distraction of unholy obsessions and keeps us tuned in on Christ’s call to follow Him. This body language of Matthew and those around him represents a pivotal moment; Matthew’s life is on the brink of something great – he can either get up and leave his money and friends to follow Christ, or he can stay where he is and continue to live his life as he has so far. If we look at Jesus’s feet, we can see them pointing away from everyone which gives his call a sense of urgency. Christ is calling, not waiting. God does not want us to wait around doing our earthly, human things and maybe get around to following his call eventually. He wants us to follow him now. Both of Matthew’s choices are simultaneously easy and difficult at the same time. Let’s imagine ourselves in Matthew’s shoes; we’re having some laughs with our friends and enjoying your day when suddenly, a man whom we have never seen before walks by, points at us, and says two words, “Follow me.” What do we do? We have places to be, people to meet, and a million other things we’d like to get wrapped up before we could even consider going along with this guy. That is not what Matthew does. Matthew simply got up and followed him. In an instant, Matthew made that terribly difficult decision; he made it look easy, in fact. 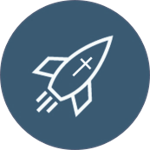 His actions set the bar high for us as we receive the very same call from Jesus that he so fluidly accepted. Let’s turn now to the juxtaposition of Jesus and Matthew. Jesus and Peter (the man standing in front of Jesus) are dressed in simple clothing and are without shoes. Peter carries a walking stick which implies that they are on the move and have no proper place to lay their heads. Matthew and his friends, however, are dressed lavishly and to further the separation, they are dressed in 17th century attire. This was likely done to appeal to Caravaggio’s audience since that was the high fashion of the time, but it gives the painting a little something extra in the distinction between a life in Christ and a life in sin. As if the calling itself was not profound enough, Caravaggio takes us even deeper with the way that he paints Jesus’s hand – there is a striking similarity to Adam’s hand in Michelangelo’s famous painting, “The Creation of Adam”. This highlights what Christ did for us as a new relationship was formed between God and His creation. Before the Word was made flesh, there was an impassible and infinite gap between Heaven and Earth. This gap is only traversable by someone who is part of both worlds and we have received such a being in Christ who is both God and man who has bridged the gap and given us the way to salvation. In Caravaggio’s painting, this idea is symbolized by the dark strip in between Jesus and Matthew’s group. This barrier is being crossed by the outstretched hand of Jesus who is the Light of the world. When compared again to Michelangelo’s painting, we can see that Jesus’s hand is similar to Adam’s, but it is facing the opposite direction. In “The Calling of St. Matthew”, Jesus’s hand is pointing the same direction as God’s hand, but it takes the same form as Adam’s hand in “The Creation of Adam”. This further accentuates the nature of Christ as true man and true God. Jesus was a man, like us in all ways other than sin, but he is also God, consubstantial with the Father. In Michelangelo’s work, God is animating the physically lifeless Adam, and in Caravaggio’s work, Jesus is animating the spiritually lifeless Matthew. Both are wonderfully beautiful creation stories. The encounter between the sinful tax collector and the sinless God-man depicted in Caravaggio’s work is representative of the encounter that each one of us, regardless of religious background, experiences in our own lives. We, along with Matthew, have a choice to make when we hear the call of Christ: will we answer the call to lead a life of holiness in imitation of Jesus, will we give into the pull of sin and fall into spiritual death? Let us ask St. Matthew to intercede for us and may we always seek to follow the Good Shepherd wherever He may lead us. Let us be inspired to follow the Lord just as the sinful tax collector so freely gave his life to Christ.